Many campuses across the country are more than just institutions for higher learning, they often have beautiful campus grounds open to the public to come and enjoy. The college’s arboretum is the crowning jewel of campus and a must see for those visiting. What exactly is an arboretum? An arboretum is a place where trees, shrubs, and plants are cultivated for scientific and educational purposes. There are lush gardens with plenty of flowers, bushes, trees, ponds, and greenery. Although their purpose is more educational, they are still beautiful to visit and take a walk around. While they may be used by students and researchers studying plant life, other students and guests are welcome to come meditate, contemplate, or learn within the arboretum. Below we’ve listed some of the most beautiful arboretums from schools across the country. These arboretums have diverse ecosystems and species. The arboretums listed below are in no particular order. The Arboretum at the University of Wisconsin-Madison includes some of the oldest and most varied collection of restored ecological communities in the world. Known as a site of historic research in ecological restoration, the arboretum is home to tall grass prairies, savannas, wetlands, and several forest types. There are flowering trees, shrubs, and a world-famous lilac collection. In all, the Arboretum is 1,200 acres in the main grounds and 513 acres in outlying properties. Experienced staff, land managers, scientists, students, and volunteers work to restore and protect biological diversity and ecosystems within the land. There are many opportunities to visit and be involved at the Arboretum. The Arboretum is open for educational tours for the general public, science and nature-based classes, and even a wide variety of volunteer opportunities available. The Crosby Arboretum is known as one of the premier native plant conservatories in the Southeast. Originally established as a living memorial to L.O. Crosby Jr., the Crosby Arboretum has been expanded to become a resource for the University and local community. The Arboretum and protected land nurtures over 300 different species of indigenous trees, shrubs, wildflowers, and grasses. Crosby Arboretum provides protection for the region’s biological diversity, as well as providing a place for the public to come and experience plant species that are native to the area. The main area of focus at the Crosby Arboretum is the 104 acre Native Plant Center. 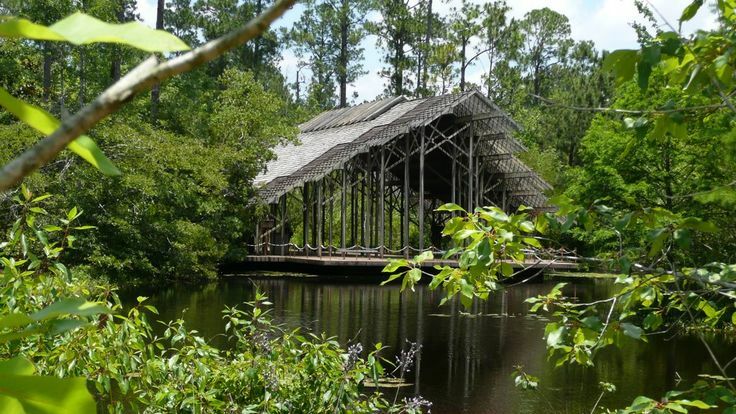 The center includes native water plants in their natural setting, and many beautiful structures including pavilions and wooden bridges. At the Arboretum, students, scientists, and volunteers study the aesthetic, agricultural, scientific, and industrial contributions of native plants and ecosystems in a real-life and hands-on way. The public is also welcome all year long to see the unobstructed variety and beauty of the area’s natural resources. The Minnesota Landscape Arboretum has a wide collection of northern-hardy plants among 1,215 acres of gardens, landscapes, and natural areas. The ML Arboretum features woodlands, wetlands, and prairies for students and guests to come enjoy and learn. There are many different ways people can come and enjoy the ML Arboretum. There are 12.5 miles of garden paths and hiking trails for visitors to walk along, close-in gardens for wondering about, or a three mile path to walk or drive along to see more gardens and collections. In the winter, there is also a Winter Wonder bus tour available two times a week. The Connecticut College Arboretum is 770 acres of diverse landscaped grounds, plant collections, natural areas, and managed landscapes. The Arboretum is divided into three major plant collections: the Campus Landscape, the Native Plant Collection, and the Caroline Black Garden. The Campus Landscape includes 120 acres of trees and shrubs from around the world. The Native Plant Collection is 30 acres of woody plants and wildflowers that are indigenous to eastern North America. The Caroline Black Garden is 3 acres of woody plants in a garden setting. More than 200 acres of the Arboretum are dedicated to lands labeled as “Natural Areas.” These lands are kept as free as possible from human disturbance, but are available for observational research, teaching, and recreation. Another 200 acres are available for manipulative projects to help students and teachers in ecological research. Connecticut College Arboretum is used for teaching and research in environmental studies, biological science, and other academic programs. Over 30 different courses at the college utilize the Arboretum in their course work. The Arboretum also offers visitors a chance to explore the diverse native plants and botanicals, as well as view outdoor performances by the Flock Theatre. Known as the “Arb,” the Carleton College Cowling Arboretum is 880 acres of land dedicated to preserving and maintaining diverse habitats. The Arb is located on a natural border between prairie and forest. In addition to prairie and forest habitats, the Arb includes an oak savannah habitat, water and wetlands, conifer plantation, and grass monoculture. The Arb is open to the public all year round and boasts many different activities and opportunities for people to come participate in. Within the Arb, many come to fish in the Cannon River. Many visitors also come to watch bird and wildlife along the 150 acre prairie as well as the upland and lowland forests. Others come and enjoy the extensive 15 mile trail system that has been ranked as the best place to run in Minnesota and one of the top 10 in the country. In the winter, trails are also available for classic and skate skiing. Created as an official Arboretum in 1997 by the school’s monks, Saint John’s Abbey Arboretum is dedicated to preserving the native landscape surrounding Saint John’s Abbey and University. Based on a longstanding principle of stewardship, those who manage the Arboretum grounds, as well as volunteers, work to maintain and restore the beauty of the land. The Arboretum is located on a transition zone between the prairies to the southwest and the hardwoods to the northeast. This position provides a variety of plants and animals to the Arboretum. The lands are home to many different birds, butterflies, mammals, prairie plants, reptiles, amphibians, and woodland wildflowers. Many come to enjoy the the Arboretum along the Chapel Trail. The Chapel Trail begins and ends at Lake Sagatagan’s beachfront. The trail is filled with stone bridges, statues, oak, pine, maple, birch, and tamarack trees, as well as plenty of wildlife. In an effort to protect and maintain the land, visitors are asked to please leave dogs and bikes off the trail. Coker Arboretum was established in 1903 by Dr. William Chambers Coker. Coker, the first Professor of Botany at University of North Carolina at Chapel Hill, developed the land into an outdoor classroom for his students to study trees, shrubs, and vines that were native to North Carolina. As he continued to teach, he added many East Asian trees and shrubs to give the land diversity. Today the Arboretum has many unique plants to offer during the different seasons of the year. The collection of plant life includes a wide variety of flowering trees, shrubs, bulb, and perennial displays. The Arboretum aims to inspire understanding, appreciation, and conservation of plants in gardens and natural areas, and to advance a sustainable relationship between people and nature. Visitors are welcome to come, explore, and learn daily from dawn to dusk for free. Many couples also hold wedding receptions in the beautiful gardens or in inside venues that are available. Over the past several decades, the F.R. Newman Arboretum at Cornell University has served several different purposes. First, the area was part of a working farm that was home to a herd of Black Angus cattle. Next in 1935, it was a camp site for 200 men from the Civilian Conservation Corps. Finally in 1981, the construction on the official Arboretum began with the encouragement and financial generosity of Floyd R. Newman, a ‘12 graduate of Cornell. F.R. Newman Arboretum is home to a variety of plants and landforms. Across 100 acres are many nut trees, crabapples, oaks, maples, shrubs, urban trees, specialty gardens, rolling hills, valleys, and beautiful panoramic views. The Arboretum at Cornell University is a place for students and the public to scientifically study diverse trees and shrubs. Visitors can learn about, and enjoy native species, as well as species imported from similar climate zones around the world. The Arboretum aims to instill in guests a scientific and educational appreciation for plants. Created in 1999 by then-Chancellor Daniel L. Ritchie, the Chester M Alter Arboretum is home to roughly 2,240 trees belonging to more than 240 species and varieties, as well as dozens of shrub species. The 125 acres also include ten state champions; the largest specimens of a particular species growing in Colorado. These include a Cedar of Lebanon, two Crabapples, an Eastern Wahoo, a Horsechestnut, a Shantung Maple, a Trident Maple, a Weeping Giant Sequoia, and a Yellow Buckeye. The Arboretum aims to delight and instruct students and visitors, as well as to establish a regional identity for the campus. Guided tours for groups are offered May through September, to give a personal and close-up look and learning experience about gardens, Arboretum history, and plant collections. Each tour is guided by an experienced staff member and lasts about an hour. Visitors are welcome to visit the Arboretum for free, 365 days a year. The Arboretum at University of Central Florida was established by President Trevor Colbourn in 1982. Originally only 12 acres, the Arboretum has been developed and expanded over the years. Today, the Arboretum is 82 acres full of a pond pine community, an oak hammock, sand pine and Florida scrub, a saw palmetto community, and increasingly rare Florida longleaf pine flatwoods. UCF Arboretum aims to be a creative learning community that supports learning through experience, urban ecology research, and interaction and connection with ecosystems and landscapes. The Arboretum also works to serve the community and make them aware of key issues in ecology and natural resource conservation. There are many ways for the community to come and be involved with the Arboretum as well. Expert guides give tours to groups wanting first hand experience with the plants and ecosystems. Visitors are also allowed to play disk golf or geocache within the Arboretum which gives them the opportunity to explore the Arboretum trails first hand. The UCF Arboretum is also always happy to have volunteers help in the community garden, assist with horticultural work in campus landscapes, or help in campus natural lands.